As Round Five of the 2013 MotoGP championship season steams toward us, the very air crackling in its wake, we are reminded of one of the oldest truths in motor sports. We are reminded that championships are rarely won in the first quarter of the season. They can, however, be lost. Such is the inconvenient truth facing Yamaha pilots Jorge Lorenzo and Valentino Rossi this weekend at the circuit that will almost surely bear Rossi’s name someday. For Team Yamaha, finishing one-two at Mugello would be like holding serve—great, yeah, but nothing to really celebrate. Anything less will range from a disappointment to a disaster, neither of which would be helpful at this point of this season. Or, actually, any point. Of any season. Not helpful at all. Expectations for Team Blue are high this weekend. As are the stakes. For the ebullient Repsol Honda team, fresh off their French triumph, putting one bike on the podium at Mugello is both necessary and sufficient. Two would be a big win. Zero only happens if someone fails to finish the race. Two Hondas on the Italian podium spells trouble for the factory Yamaha team. Trouble we might have seen coming, had we been paying closer attention to the season and less attention to Losail. Losail affected our thinking, putting the end of last season, and the entire offseason testing program, out of our heads. That was an error in perception. My error, though I’m probably not alone. But Losail is, after all, the outlier, the season opener under the lights in the desert, and doesn’t really have much of anything to do with anything else. So Lorenzo and Rossi’s surprising 1-2 at Losail obscured the fact that Honda appeared to have it very much going on heading into the season. Other than at Losail. Since then, that has been the exact case. One/two, one/two and one/three in three “normal” rounds. Yamaha might insist we throw out Le Mans as the second outlier—France in the cold and wet—but even doing so, the blue bikes are not keeping up. Not in Texas or Jerez, which isn’t really surprising, given the layouts. But not in Le Mans, either, where Yamaha success has generally come easily. True, Rossi was flying when he crashed in France and looked to have podium written all over him, but such is life running with the big dogs. Changing of the Guard Underway? If, as expected, Pol Espargaro signs a one year deal with Monster Tech3 Yamaha, it suggests the Rossi era at Yamaha will end, again, after the 2014 season, in The Doctor’s 35th year. 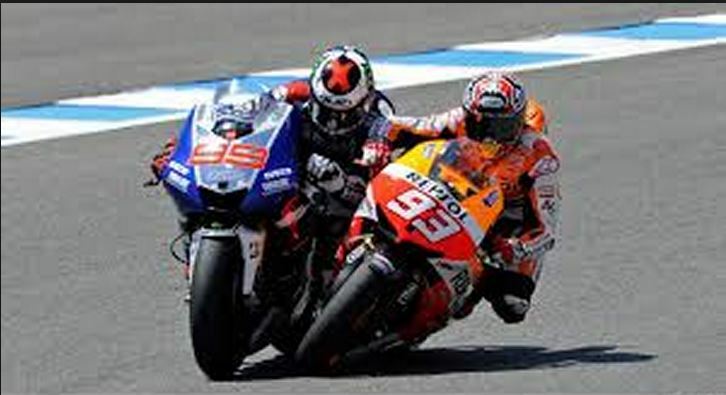 It will point to Lorenzo and Espargaro fronting the factory team versus Pedrosa and Marquez on the Hondas. It means Yamaha will have to find more acceleration, while Honda seems to have found all it needs. There is, too, the outside possibility Dani Pedrosa would not be offered a new contract at the expiration of his current deal after 2014. To ride the Repsol Honda for nine (9) years, with all those wins, but no titles…And it doesn’t get any easier at age 30, which will be the age he turns in the first year of his next contract. There must be those at Honda Racing HQ who have run out of patience with the gutsy little Spaniard. They want titles; they don’t get all choked up listening to the Spanish national anthem. Anyway. If Marc Marquez is, indeed, The Next Great Thing and, by extension, Espargaro the Next Next Great Thing, then whom, we wonder, is the Next Next Next Great Thing? Scott Redding? Alex Rins? Alex Marquez? It was only 2011 when Marco Simoncelli looked like The Next Great Thing. Whomever he turns out to be, he will enter MotoGP at a time when it is becoming homogenized. When the prototype bikes will be getting slowed and the CRT bikes faster. When teams will likely experience more sudden success and more thorough financial failure. Where the rules will continue to bend in favor of the more democratic CRT bikes, and away from the monolithic factory behemoths and traditional sponsors who have funded and ruled the sport forever. The revelation that Dorna Big Cheese and magnate Carmen Ezpeleta is a closet socialist is too sweet. He’s starting to make MotoGP sound like kids’ rec league soccer, wanting “EVERYONE to get a trophy!” “Yes, we would like 30 bikes that all go the same speed and that cost the teams €100,000 each only. They can use as much fuel as they like and are limited to 12 engines for the season. No other rules. We don’t need no more steenkin’ rules. 12 engines. €100,000 each. Plenty of gas. Brolly girls. That’s IT.” Which, in the opinion of a lot of purists, is in fact desirable. Delusional, but fun to think about. MotoGP is morphing, squeezed by economics , resembling World SuperBikes more each year. Now, if Aprilia would step up with a two bike factory team, and if Suzuki could become relevant again. Wouldn’t it be fun to see, say, Nicky Hayden and Ben Spies united on a hot new Suzuki MotoGP team. If not Hayden, then perhaps Spies and Redding, who currently rides 9kg over the weight floor in Moto2 and would be a force on 1000cc. How about Big Brother Aleix Espargaro and Crutchlow fronting a factory Aprilia team? If Little Brother gets a prototpe, it’s only fair that big brother gets one too. MotoGP success for team Yamaha in Italy—both bikes on the podium—would move the focus to the following three rounds, spaced bi-weekly, more or less, in Catalunya, Assen and the Sachsenring heading into the heat of the summer. Catalunya favors Yamaha. Assen and Germany both favor Honda, at least recently. Let’s review. Team Yamaha needs to score a lot of points in Italy and Catalunya, keep it close in northern Europe, and hope to still be in it heading for the U.S. in July and August. Otherwise, we’ll be reduced to arguing Marc vs. Dani or Dani vs. Marc. When we’re not scratching our heads over whatever became of Stefan Bradl. Or ruminating about why Cal Crutchlow doesn’t get any respect from owners. As to our hope for two competitive factory teams at the top of MotoGP in 2013, one of two possible answers will emerge in Tuscany: If Pedrosa and Marquez continue their hot streak at Mugello, it will probably mean Honda all the way in 2013. That would be a No. If Lorenzo and Rossi find what they need and dominate the proceedings, that would be a Maybe. Let’s not forget the 2010 race. Mugello that year was Round Four. After Round Three in France, Lorenzo led Rossi 70 to 61, Dovizioso trailing in 3rd with 42. Rossi had his high side in practice and was suddenly down and out of the chase for the title. After Mugello, it was Lorenzo 90, Pedrosa 65, (Rossi 61), Dovizioso 58. It was essentially over, suddenly Lorenzo’s to lose. In the blink of an eye. At 200 mph on two wheels with the best in the world on the best of the world, as observed in Forrest Gump, “(stuff) happens.” Marquez, to his credit, has been off his bike only once thus far in his premier class debut. Pedrosa, on the other hand, has been separated from his too often to count over the years, generally with bad and lasting effects. Marquez’s style seems to invite the close encounters he’s enjoyed over his brief career. But he, too, has memories of Sepang, where he hit his head hard enough in 2011 to have double vision for the next six months. While the rest of the world grieved for Sic, Marquez also dealt with the possibility that his promising professional career had ended before it fully started. As we’ve already seen, such worries were misplaced. See live coverage of the Italian Grand Prix Sunday at 7:30 am EDT on SpeedTV. We’ll have the results of the race here on Sunday afternoon.